Starbright Necklace was inspired by nights spent gazing at the stars and wondering about the constellations above. We were especially inspired by the mythological story of Pleiades and how seven sisters literally became stars. For millennia we have always been fascinated by stars, the sparkly luminous points of light embedded in the dark night sky. Long before any understanding of the stars scientific significance, the stars’ association with the heavens represented the interrelationship between light, spirt and darkness. Since then the five pointed star with its symbolic representation of the twinkling of stars has become an icon. Stars often symbolise heavenly bodies, purity and good luck. 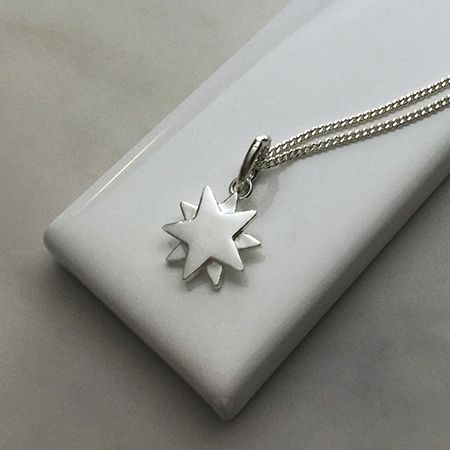 In dreams, a shooting star is said to be a sign of self-fulfilment and advancement, making the Starbright Necklace a perfect token for those chasing their dreams. Our Starbright Collection makes for the perfect gift for that super star in your life. Remind someone just how much you appreciate them and all that they do for you and give a them a double star charm, necklace, ring or stud earrings. Oh so spoilt for choice. The pieces from our Starbright Collection is the perfect gift for someone aspiring to reach their dreams. Tell them to dream big, believe and be awesome. The Starbright Necklace, Starbright Ring, Starbright Stud Earrings or Starbright lucky charm is sure to give them great motivation and is a sure gift to encourage them and inspire them in their pursuit of their wildest dreams. Never Give Up. Starbright Necklace by Bianca Jones Jewellery, for the star in your life.